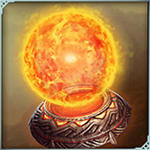 Sulric is your first ancient, which is given during the tutorial. 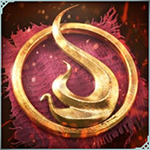 After Sulric's selfless sacrifice, it was this very spell that destroyed the Sleeping Flame worshipers. Rains fire down upon a location, dealing 4 waves of 22 - 23 damage for a total of 86 - 88 damage. A variation of the spell used by the Sleeping Flame to preserve Sulric's mortal body in the volcano's belly. Halves the damage from all Spell Towers and grants immunity to their debuffs for 7 seconds. Greater Elementals are known for turning on their masters. But, either out of respect or fear, Sulric has suffered no such retaliation. Summons x1 Greater Fire Elemental, ignoring deploy zone restrictions. These units absorb mana for power. Gaining up to 250% bonus damage. On death they explode for 43-45 damage, increased by the current damage. 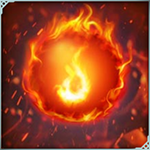 Upgrading increases the level of the Fire Elemental. Consume to increase the rarity of Sulric or Anir. Increased by one step up to a maximum of Epic. Consume to increase the rarity of an Epic Sulric or Anir to Legendary. 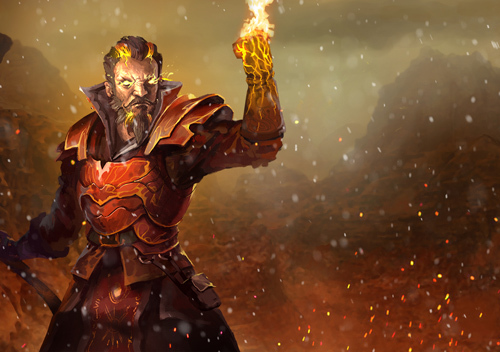 Consume to increase the rarity of a Legendary Sulric or Anir to Mythic. Sulric and his people once lived near the slopes of an ancient volcano. They had come to believe that the sleeping spirit of a dormant Fire God resided there.